A bird’s eye view of Swan Lake Flat and the Golden Gate area just south of Mammoth are among the panoramic views from the top of Bunsen Peak. 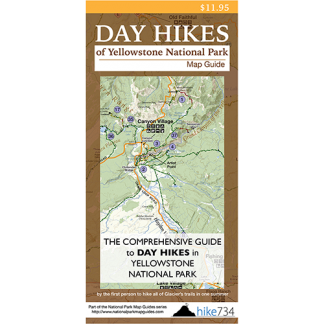 The trail starts near the area known as the Golden Gate, and continues through sagebrush meadows as it climbs. The trail meanders through patches of trees as you gain elevation, and the views of Swan Lake Flat get better with each step. The trail then spends time along steep cliff edges looking north towards Mammoth. Nearby, the hillside is covered in fantastic yellow rock structures and the area further out known as the Hoodoos is visible. Care should be taken as the footing on the edge can be treacherous. The trail begins to switchback steeply the rest of the way to the radio cabin and antennas at the top of the peak. The panoramic views are great from this distressed terrain. From here, most people turn around. 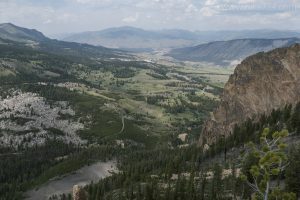 Trailhead: Head south from Mammoth Hot Springs on Grand Loop Road, just past Golden Gate. Immediately upon entering Swan Lake Flat, look for an unsigned parking lot. The trailhead for Bunsen Peak is on the east side of the road at the end of the parking lot.